When and why to use the Paul Mitchell Super Skinny Serum? What does its formula look like? What are the tips when using it? What are the main outcomes of the serum? No matter how much you may be loving your black curls, taming them and getting rid of the frizz may drive you crazy at times so finding a hair product that helps you get in control over your black curls is essential. 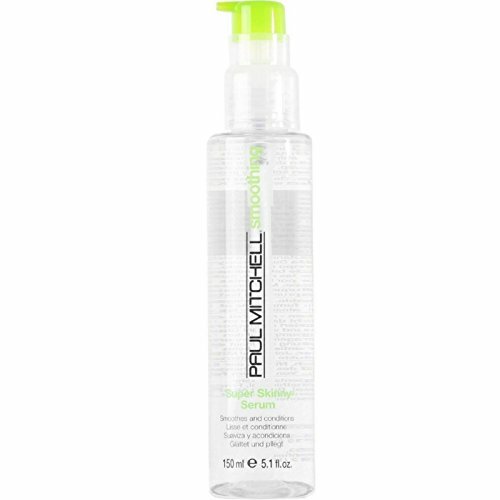 You’d want to use the Paul Mitchell Super Skinny Serum for removing frizz from your hair, no matter how the weather gets. The serum keeps your hair silkier and frizz-free for longer time. The lightweight serum smooths in a nice way your curls and adds just the right amount of shine to your hair, while conditioning it at the same time. When used on wet hair, the serum also helps with the drying time, speeding up the process. The serum goes deep in your hair shaft, smoothing and leaving it shiny and frizz-free for longer time. Even though its formula isn’t revolutionary, the serum stands out from the crowd with the combination of ingredients that explain its efficiency. One thing to begin with when we talk about its formula is the fact that the serum doesn’t contain paraben nor gluten. Additionally, it’s vegan and safe to use on color treated hair too. Limonene- is a colorless liquid that has a subtle and fresh, sweet citrus scent that is typically added to flavors and fragrances. It’s a substance that naturally exists in many citrus fruits. It’s commonly used in formulation of bath products, bubble baths, eye shadows, cleansing products, lipsticks, mascara, moisturizers, colognes, shampoo and, obviously, hair products. Geraniol- is a clear to pale-yellow oil with a rose-like odor and it’s popular in the formulation of many cosmetic products, hair care products including. Amyl cinnamal- is a pale yellow liquid that has a nice floral scent, resembling jasmine. It’s typically used in the formulation of body and hand products, bubble baths and hair products. it also happens naturally in some plants, but it’s more often synthesized for the cosmetic use. The serum has a lightweight consistency that is easy to spread on your hair. It doesn’t weigh down your hair and is great for eliminating split ends. You should use it on dry, tough and tangly hair for easier styling and managing. A little goes a long way so you’re going to be able to use it for a good amount of time. As long as you’re using just the right amount, the serum shouldn’t leave a greasy nor a sticky feel on your hair. You should rub only one pump into your hands and apply it to your damp hair. It’s always better to begin at the ends and work all the way up to your scalp. Once it’s evenly spread all over your hair, you may style your hair the way intended. Keep in mind that the serum is pretty concentrated so you may need to work it a bit between your hands for easier and smoother spreading. The smell is amazing and you can safely use the serum on dry, wet or damp hair. It’s efficient and reliable and works even on dry hair. The thick and coarse hair becomes easier to style and the flyaways will soon be gone. Another thing to also remember is that the serum has not been evaluated by the Food&Drug Administration. This means it’s not made for diagnose, cure, treat or even prevent any sort of hair/scalp-related diseases. One may simply not go for the smell. If you’re ever looking to get in control over your curls, but also to style and dry your hair easier and faster, don’t skip on the Skinny serum when shopping. And, if you’re also in need of a serum that smooths and gives a nice shine to your hair, you’re definitely on the right track with this one. Recent reviews: the Makari Classic Duo pack, Mesoestetic Cosmelan 2 Lightening Cream, the Shiseido White Lucent Spot Corrector., the Clinique Deep Comfort Body Lotion, the Neocutis Perle Skin Brightening Cream review.